Biography of the devoted friend of Imam Husayn (a). The desert was very vast. The sky was full of stars. An old man aged seventy-five left his tent. The old man jumped on his horse and rode away. The old man heard a wolf howling. He was afraid of nothing. He intended to get to Mudharib (Bani Asad's tribe) near the Euphrates. When the old man got there, some dogs barked at him. Some men of Bani Asad's tribe were sitting in a big tent. They were chatting with one another at night. The old man greeted them. They stood up for him. He looked dignified, but they did not know him. The old man sat down. He had a beard. His beard was as white as cotton. The men began looking at his calm expression and his white beard. The old man introduced himself to the men in the tent. I'm Habib bin Mudhahir: I belong to Bani Asad's tribe. Habib is telling you the truth. He's bin Riaab bin al-Ashtar bin Fakas bin Tareef bin Qais bin al-Harith bin Thalaba bin Doodad bin Asad. This is the companion of Allah's Apostle. He has lived in Kufa since Imam Ali's Caliphate. He stood by him at the Battle of Camel, the Battle of Siffeen, and the Battle of Nihrawan. Bani Asad's Shaikh, what have you brought? I've brought you good no leader has brought to his people. Al-Husayn, Ali and Fatima's son is around. A group of the believers has accompanied him. His enemies have surrounded him. They want to kill him. So, I've come to you. I ask you to defend him against his enemies to save the dignity of Allah's Apostle. By Allah! If you support him, Allah will give you honour in here and hereafter. May Allah thank you for your effort. You've brought us a good deed. I'm the first to defend al-Husayn against his enemies. The number of the volunteers became ninety fighters. Habib took them and headed for an area called Karbala. Their Imam Husayn [a], his family, and his believing supporters had camped there. A man belonging to Bani Asad was a traitor. He took advantage of the darkness and hurried to tell Umar bin Saad, the leader of Yazeed's Army, about Habib and his friends. Yazeed's Army had besieged Imam Husayn's caravan and prevented them from drinking water. Umar bin Saad formed a division. The number of the division was five hundred horsemen. Al-Azraq headed them. The horsemen hindered Bani Asad. Al-Azraq asked them to come back, but they refused. A fight took place between the two sides. So, some men of Bani Asad were killed and some were wounded. The volunteers knew that there was a big army before them. And there were big supplies behind the army. For this reason, they decided to come back. When the volunteers got to their tribe Mudharib, they warned it of staying at that area. 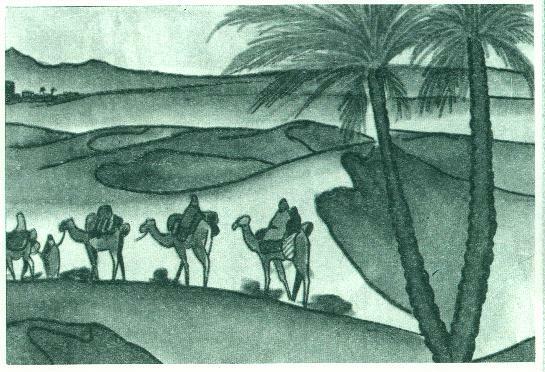 The men quickly collected their tents and moved to another place in the desert. There's neither might nor power but with Allah! Mu'awiyah died. His son Yazeed succeeded him. So, the Caliphate became a kingdom. Yazeed was a bad man. He drank alcohol. He committed illegal actions. He amused himself with his dogs and monkeys. Thus Imam Husayn [s] refused to pay him homage. The people in many Muslim cities suffered from Mu'awiyah's unjust policy. They wanted him to die to get rid of his bad behaviour. When the Muslims knew that Yazeed would be the Caliph, they felt pain and were full of anger. They opposed his rule because he did not respect Islam and Muslims. The people in Kufa liked Imam Ali [a] because he was just and merciful. Besides they knew al-Husayn's good behaviour and his kind treatment towards his Muslim brothers. Therefore, they sent him many letters. Come to us! You are our leader only! Imam Husayn [a] accepted the Muslims request. He decided to revolt against Yazeed bin Mu'awiyah. He took his family and supporters and left for Kufa. 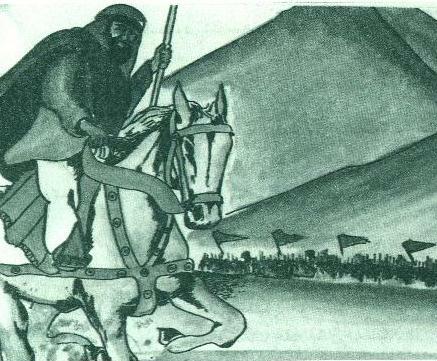 Ubaidullah bin Ziyad had sent a military division. The number of the division was one thousand horsemen. Its aim was to hinder Imam Husayn's caravan. It was very hot. Ubaidullah's horsemen used up their water. Imam Husayn [a] took a pity on them, and ordered his companions to give them water. Imam Husayn [a] camped near River Euphrates. Ubaidullah appointed Umar bin Saad over the division. Umar bin Saad occupied the riverbanks. He prevented Imam Husayn [a] and his companions from drinking water. Why have you come to Kufa? Yes, this is Qurra bin Qais. I know his good opinion. I don't think he'll fight you. The people of Kufa have asked me to come. If they hate me, I'll leave them. Qurra, woe unto you! Don't come back to the unjust people! Support Imam Husayn! I'll tell Umar about Imam Husayn's answer. Then I'll consider your request. Obey Ubaidullah bin Ziyad, otherwise we'll attack you! Al-Abbas came back to Imam Husayn [a] to tell him about the enemy's attitude. By Allah, tomorrow, Allah will regard you as bad people! How will you meet Him while you are going to kill Imam Husayn and his family? Don't you know that they're the Prophet's grandsons? Don't you know that they pray to Allah after midnight and remember Him very much? Allah has praised and guided him. Uzrah I advise you to fear Allah! Go back and ask them for time to pray. We want to pray to Allah tonight. We want to ask Him to forgive us. Allah knows that I love prayers, reading the Qur'an, and asking forgiveness. We'll give you a chance till tomorrow. If you give in, we'll take you to Emir Ubaidullah bin Ziyad. If you refuse to give in, we won't let you go. Imam Husayn [a] gets ready to fight. Imam Husayn [a] and his companions began praying and reading the Qur'an, for it was the last night in the world. The tents were here and there. Imam Husayn [a] wanted to prevent the enemies from penetrating them. So, he ordered his companions to tie them to each other. He also ordered his companions to dig a trench at the back of the tents to fight the enemies at one front. I praise Allah with the best praise! I am thankful to Him in all conditions whether pleasant or otherwise! Allah, I thank you for making my grandfather a prophet and teaching us the Qur'an! I thank you for giving us ears, eyes and hearts. I thank you for you have not made us polytheists! I don't think that there are companions better than mine, there's a family more loyal than mine! May Allah reward you all. I think that we'll face those enemies tomorrow! Now you may go! We'll sacrifice our lives, money, and families to defend you against the enemies! We'll stand by you! A young man came to Imam Husayn's camp. He was looking for his father Muhammad bin Basheer al-Hadramy. My brother is a prisoner of war at Ray (a town near Teheran). I'll support Imam Husayn at any rate! You're free. Go and release your son. By Allah, I won't leave you! Give your son these garments to release his brother. Thus Imam Husayn's companions preferred death with him to life with the unjust. At midnight, Imam Husayn [a] went out to see the nearby hills. One of his companions, named Nafi bin Hilal al-Jamaly, saw and followed him. The Imam asked his companion about his going out. Son of Allah's Apostle, I'm anxious about you. I've gone out to see the nearby hills. Why don't you go through those two hills in the dark to save yourself? No! By Allah, I won't leave you alone! I want to be killed with you! Are you certain of your companion's intentions? By Allah, I've tried them. They are brave. They are ready to die for me. We'd better go to her to relieve her worry. Let us go to Zaynab's tent to relieve her worry. By Allah, we're ready to sacrifice our lives for you! Good companions, defend the grandsons of Allah's Apostle against their enemies. Habib and his friends wept. They decided to fight till death. Imam Husayn's [s] companion went to their tents. Some companions went to bed to get ready to tomorrow's fight, and some began praying and reading the Qur'an. Al-Husayn was in his tent mending his sword. He felt tired and closed his eyes. We belong to Allah, we shall come back to Him! In the morning, Muharram 10th, Imam Husayn [a] and his companions said their prayers. Imam Husayn [a] prepared his companions for the battle. 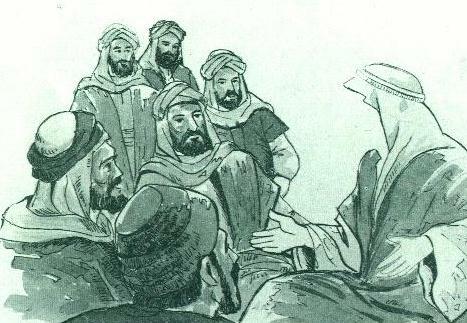 He divided them into three small groups: Zuhair bin al-Qain headed the right wing. Habib bin Mudhahir headed the left wing, and al-Abbas, the Imam's brother, headed the core. 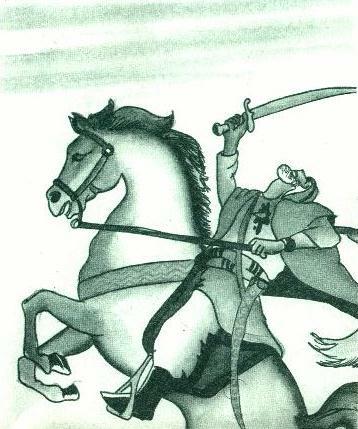 Imam Husayn [a] rode his she-camel and stood before Yazeed's Army. He preached and advised them. He warned them of committing such a crime. All Imam Husayn's efforts were in vain. Satan led Yazeed's fighters astray. So, they forgot Allah. Yazeed's army began attacking Imam Husayn's army, throwing many arrows at them. Good companions, stand up for death! The two sides met for the first time in a small clash. The clash was over and the Imam's companions came back to their places. Then Yazeed's Army launched savage attacks against the Imam Husayn's companions. Imam Husayn's companions resisted the attacks bravely. Some of them fell over the ground and died martyrs for the Prophet's grandson. Amru bin al-Hajjaj began a big attack. Imam Husayn's companions faced the attack and fought bravely. Muslim bin Ausajah, a companion of the Imam's, was fighting with enthusiasm. Then he was badly wounded and fell over the ground. Imam Husayn [a] saw Muslim lying on the ground. He and Habib bin Mudhahir attacked Yazeed's Army. They saved Muslim bin Ausajah from them. Muslim was about to die. Muslim, may Allah have mercy upon you. I'm giving you good news about the Paradise. May Allah give you good news! I wish I could listen to your will, but I'll die after you. Habib, I ask you to die for Husayn! By the Lord of Kaaba, I will! On that day, Habib was full of happiness. His face was smiling. I'm happy because I'll be killed and enter the Paradise! The fights went on till noon. A companion of Imam Husayn's looked at the sun. He knew that it was time to pray. Imam Husayn [a] asked Yazeed's Army to stop fighting to say their prayers. Husayn, Allah won't accept your prayers! Donkey! Will Allah accept your prayers, but won't accept the prayers of the Prophet's grandson? Al-Husayn bin Numair was full of spite. He whipped his horse and attacked Habib. Habib faced him. He hit al-Husayn's horse on the face. So, al-Husayn bin Numair fell over the ground. Many fighters rushed to save al-Husayn bin Numair. Habib clashed and fought them bravely. In spite of his old age, Habib could kill over sixty fighters. When the fight became strong, a fighter threw a spear at Habib. So, Habib fell over the ground and became a martyr. Thus the brave companion's life was over. He spent all his life waging holy war for Islam. Al-Husayn bin Numair was not satisfied with killing Habib. He took his head and tied it to his horse's neck. Then he began roaming through Yazeed's fighters. He was boasting of his bad action. We belong to Allah and we shall come back to Him. Imam Husayn [a] came back to his camp. He was sad because he lost the closest and the most loyal companion. Today Muslims all over the world go to Karbala to visit Imam Husayn [a]. In the distance, they can see a high gold dome and high minarets. When a Muslim enters the holy shrine full of perfume, he will find a tomb near Imam Husayn's tomb. That tomb belongs to Habib bin Mudhahir, Bani Asad's leader, and the master of the loyal. Peace be upon Habib bin Mudhahir al-Asady.